What kind of Aloe is this? 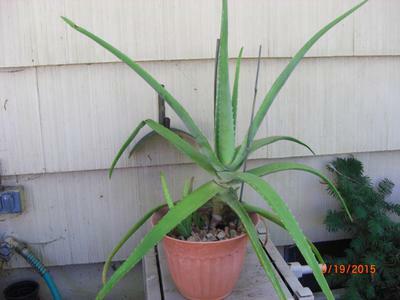 I've had this Aloe for probably 8-10 years. It started very small, and it's gotten very large! It just started "having pups" this year. It doesn't look like other people's aloe veras that I've seen so I don't think it's that kind of aloe - but I don't really know! It has developed a trunk that its leaves grow from, rather than the leaves growing from a "central point". It started leaning way over to one side and since it was so top heavy, the pot kept tipping over. So I staked it to keep it upright. It has no spots, but the pups have white spots. Anyone know what this crazy looking aloe is? Comments for What kind of Aloe is this? Aloe is a huge genus. Aloe vera is only one of thousands, and there are lots of totally unsuitable types being sold all over just because they're cute when they're young. As you have discovered, they don't stay young for long. You can see more about Aloe here and here. It looks like Aloe arborescens.